YouTube is every procrastinator’s first port of call. It’s hard to believe, but there are people who also use the popular video site as a creative platform, rather than a cat-filled time drain. Take Patty Walters, for example. At the last count, the Minneapolis-born vocalist’s filmed cover versions have earned him a whopping 429,756 subscribers. It’s proved invaluable in giving his Brighton-based band help in getting a foot on the first pizza-smeared rung of the pop punk ladder. 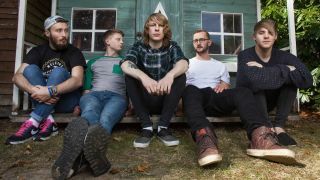 Walters – who has been a UK resident for the past 18 years – has long had ambitions of being in a pop punk band, but various attempts with guitarist Andy Westmead had proved unfruitful. It was only when Walters met fellow vocalist and guitarist Ben Biss on the same “pretentious university course” that the pieces began to fit together. With the addition of drummer Patrick Foley and bassist Ali Testo, Walters’ pop punk vision quickly became realised. After an period of writing and honing their own songs, the five-piece released a handful of EPs and found a tight-knit UK scene to jump right into. Thanks to Walters’ presence on YouTube and the band’s dogged touring ethic, they’ve steadily built up a fiercely dedicated following over the past few years. This didn’t go unnoticed by US label Fearless, who made As It Is their first British signings. Their first single, Dial Tones, taken from their forthcoming debut album, is one of the most infectious songs you’ll hear all year. At the time of writing, the video on YouTube alone has had 343,261 plays in a matter of weeks. We might only be six weeks into 2015, but As It Is already appear to be the success story of the year. For more information on As It Is, check out their official Facebook page.